The Little Nonprofit That Could: When all other, much larger organizations and institutions decided to put their priorities elsewhere, the Friends of Herrontown Woods (FOHW) stepped up to clear overgrown trails on 210 acres of public open space at Herrontown Woods and Autumn Hill Reservation. One could say that we succeeded in part because we are a small organization, focused on one corridor of open space. Now in its fifth year of maintaining trails and habitat at no cost to the county or town, FOHW seeks to acquire and repair the Veblen buildings that are the cultural soul of Herrontown Woods. In December, 2013, Mercer County offered to transfer the Veblen house, cottage and associated land to the Friends of Herrontown Woods. Since then, FOHW has become an official 501c3 nonprofit, built a critical mass of board members, and in February, 2017, submitted a proposal detailing planned repairs, along with insurance documentation. After having already done so much to serve Princeton and Mercer County, we believe we deserve a positive response from the county. Veblen Center and Ecological Campus: FOHW’s proposal is to create a Veblen Center and ecological campus. The garage is essential for storing the tools we use to maintain Herrontown Woods and Autumn Hill reservation. Exterior repairs will make the Veblen House a more attractive landmark, followed by inside repair with the goal of holding meetings and small cultural events such as talks related to the many themes from the lives of those who lived in or visited the house since it was built in 1930. The Veblen cottage, barn and corncrib are important landmarks evoking the spartan lifestyle of self-sufficient 19th century farmers. A Bringing Together: What happens when we bring mathematicians together (as Veblen did at Old Fine Hall), Old and New World together (in the 1930s Princeton math department, the Veblens' marriage, and the Veblen House’s features), mind and body together (the "woodchopping professor"), parcels together (to create open space), nature and culture together (in Princeton at Herrontown Woods, Mountain Lakes, the Princeton Battlefield, the Johnson Education Center)? This theme, running through the Veblens' lives, gains ever more relevance in an increasingly fragmented world. The Veblen House is a key destination along an extraordinary corridor of preserved open space. In its tranquil setting, it is seen as a future meeting place for the community, for cultural events and for neighborhood dinners. Mathematics: There is romance in numbers, from the numerical discipline within which Shakespeare spun his timeless webs, to the measuring and 3-dimensional envisioning of carpentry, to the mathematics underlying nature, and a charming story called The Dot and The Line. Mathematics may have brought the Veblen House to Princeton. A prefab, it arrived in pieces with J.P. Whiton-Stuart, whose interest in mathematics may have influenced his move to Princeton with family in the 1930s. We look forward to exploring all these dimensions of mathematics, in programming and as Veblen did, during meditative walks through Herrontown Woods. Legacy and Generations: How Veblen's legacy is viewed may speak to how our legacies will be viewed in the future. Veblen, the visionary in academics, math, computers, and land preservation, played a role in building the American century. What sort of century will we build, and how do the insights of past generations and the prospects of future generations inform how we live our lives? The Veblen Cottage--Actually an 1875 farmhouse, well built of wood that has survived neglect, hearkens back to an era of self-sufficient farms along the ridge. It was built just before Veblen’s birth in 1880. 19th century features include balloon framing and brick nogging. One family that lived there in the 1930s would invite Einstein in for a sandwich when he was walking by. Veblen used the cottage as a study, heated by a wood stove in the winter. Its simplicity contrasts with the opulence of his design for Old Fine Hall on the Princeton campus. Now surrounded by woods, with a small barn and corncrib nearby, it represents a simple lifestyle, elements of which can inform sustainability in our own more urban lives. FOHW seeks initially to stabilize and weatherize the structure, to preserve it as a landmark that speaks to the era of micro-farming common in the Herrontown neighborhood in the 19th and early 20th centuries. To satisfy the curiosity of passersby, unbreakable clear polycarbonate over windows will provide security while allowing views into the rooms--essentially a "see-through museum". Open Space Infrastructure for eastern Princeton: Though the western half of Princeton has Mountain Lakes House, Clark House, the Updike Farmstead, and the Johnson Education Center, eastern Princeton lacks any buildings to complement its system of open space preserves and trails. The Veblen House and cottage can help reduce that disparity. Partnering with nearby institutions: Bordering Herrontown Woods are Stone Hill Church, and the Princeton Learning Cooperative, housed in All Saints Church. Both serve the home-school community in the Princeton area. The Friends of Herrontown Woods leads nature walks for the students. Restoring Habitat: Though more intact ecologically than most nature preserves, Herrontown Woods can benefit from removal of invasive plant species that do little to feed vital food chains. The Friends of Herrontown Woods has been very active in removing invasive species, first along long-blocked trails and now in woodlands and on the Veblen grounds. Various historic features around the Veblen House are now visible due to removal of invasive shrubs. Preserving Princeton's Cultural Heritage: Two traditions come together at the Veblen Farmstead--the micro-farming that was common in the Herrontown neighborhood of northeastern Princeton in the 19th and early 20th centuries, and the movement of European intelligencia to Princeton in the 20s and 30s that Veblen did so much to facilitate. Einstein was a close friend of Veblen's, and a frequent visitor. The "house in the middle of the woods" is also a European tradition, which Veblen's Scandinavian heritage speaks to. Elizabeth Veblen grew up in Yorkshire, England, and became a central figure in Princeton's social circles. Sustainability: Demonstrating the many home and landscaping practices that come under the broad heading of sustainability. Off-the-grid living, low-maintenance landscaping, demonstrating home energy monitors, utilizing urban timber, fixing slightly broken items for reuse--these are some of the projects that would show how to shift towards lifestyles that will leave a healthy planet in our wake. Relevant to this cause, the phrase "conspicuous consumption" was coined by Veblen's uncle Thorstein in The Theory of the Leisure Class. Prefab Architecture: The Veblen House is a prefab from the 1920s, moved to Princeton from Morristown, NJ. Its double wall construction, with what appears to be decay-resistant chestnut boarding inbetween, has contributed to its resilience. A system of vents appears to have contributed to keeping it comfortable. Inventive architecture to solve today's sustainability and social needs can be another theme. Creative, low-cost repair: New Jersey has an abundance of historic structures, many of which deteriorate for lack of funds and vision. Some get rehabilitated, but often at great expense. While governments and larger nonprofits show no interest in small historic buildings like Veblen House, small organizations like Friends of Herrontown Woods can demonstrate lower cost methods of repair and reuse that will broaden the safety net for New Jersey's historic structures. Gardening: Elizabeth Veblen was an avid gardener. Both the Dogwood Garden Club and the Garden Club of Princeton were active on the grounds in years past. Gardening, whether it be Elizabeth's beloved daffodils or a demonstration of native landscaping and permaculture, will be an important component of the vision. 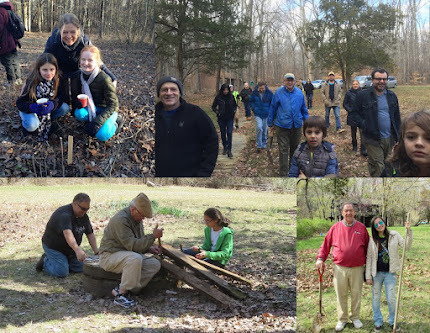 Already, the Friends of Herrontown Woods has discovered and protected native orchids growing in the field near the Veblen House, and has planted native chestnuts, butternuts, hazelnuts, and a pawpaw patch.